The Shabby Stamper: The first time out of the box! I've had this set for a year, but hadn't ever been inspired to use it. What was I waiting for? I love this set! After multiple starts and color combinations, this is the final result. I layered Always Artichoke, Ruby Red, Chocolate Chip and Vanilla cs. The Chocolate Chip laters are stamped with Antique Background in CC. The main image is watercolored, then sponged in Close to Cocoa and Chocolate Chip, then overstamped with Canvas in Sahara Sand and the spatter from Itty Bitty Backgrounds in Soft Suede and Sahara Sand. The tab is also overstamped with Canvas in Sahara Sand. I took the floral garland from the "Best Wishes" stamp from Oval All to add interest to the bottom of the tab. OMGosh that is gorgeous! I love the watercoloring - its done so well! 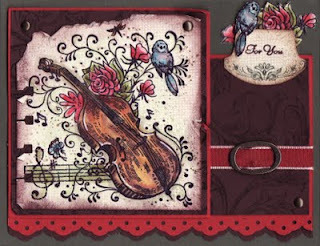 I love the torn paper and the sponging and the spiral punch and......ok - I love everything about this card! Just beautiful!!! Yes, I agree with Jacki -- gorgeous!! Your watercoloring is always so perfect. It is a real treat for me to visit your site -- thank you for sharing with us. Beautiful, love the water colouring. I agree with all of the above comments. Amazing card. Oh boy ,this is stunning!! So glad you decided to finally get it out! Your coloring is perfection and I adore the round tab with the flowers and bird- just exquisite! I LOVE it! And I've had it for a year too, and haven't used it! And my kids (and my two sons-in-law) are all musicians! Isn't that goofy that I haven't used it? Thanks for the awesome inspiration!